Geocaches come in all shapes and sizes but more often than not its a fairly plain container cunningly hidden somewhere interesting. The PE cachers have been stepping it up lately and more and more interesting containers are seeing the light of day, but every now and then something really wows you. Cacher Seekoei NMB has been doing a series of novel caches over the last year or so. 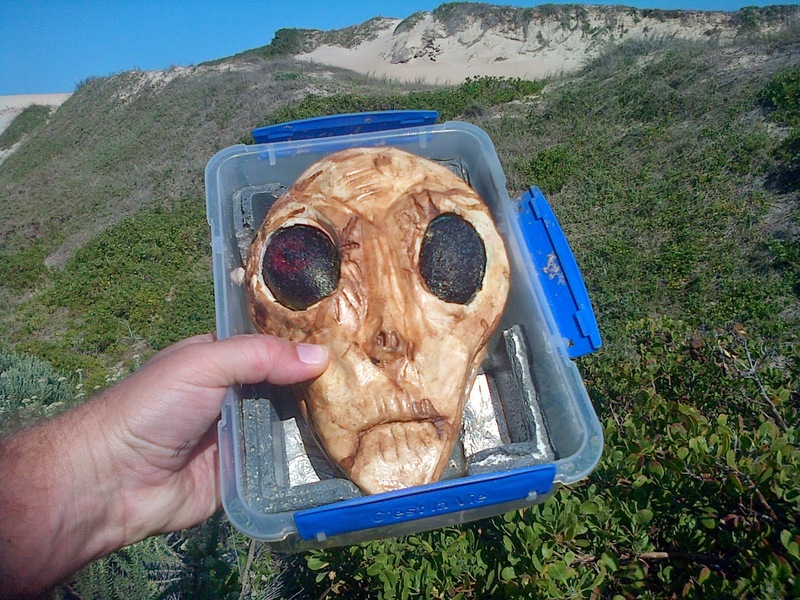 One of them was this alien's head placed at... No, I'm not going to tell you. Rather take up Geocaching and see if you can find it yourself. When most South Africans use the term Sho't Left it is on a taxi and means that they are going a short distance and jump off just around the corner. South African Tourism has adopted the term for its domestic campaign to encourage locals to go on short inexpensive getaways to explore South Africa. This means that in tourism terms a Sho't Left is a weekend break only a couple of hours away from home. SAT released a series of Sho't Left campaign videos a year or so ago and I absolutely love the tune they use for it. It is really catchy and has become part of what Sho't Left is for me. As one who like to explore with the family, I try to get us to go away on a Sho't Left as often as possible doesn't matter if its for a day, weekend or a little more. Watch this video and use it as encouragement to break away on a Sho't Left from PE... or Jozi or Cape Town or Durbs or where ever you are in the world. Route 67 around the Donkin Reserve has some really interesting art pieces ranging from real taxi's mounted on a wall to the 470 square meter Piazza Mosaic next to the Pyramid. Then there's also the Voting Line with Madiba's figure at the front standing under the tallest flag pole in South Africa sporting a 10 m x 15 m South African flag. A couple of weeks ago I had to meet a friend of mine for a business breakfast and she suggested we go to the newly opened Fratelli Foods in the Lower Baakens Valley. Fratelli is an Italian Deli and Coffee Bar and at that stage they hadn't even had their signage up yet but I had a feeling that it would turn into a very popular spot very soon. I immediately joined their Facebook group to keep an eye on them. Yesterday morning there was a post on the group showing the newest addition on their menu. 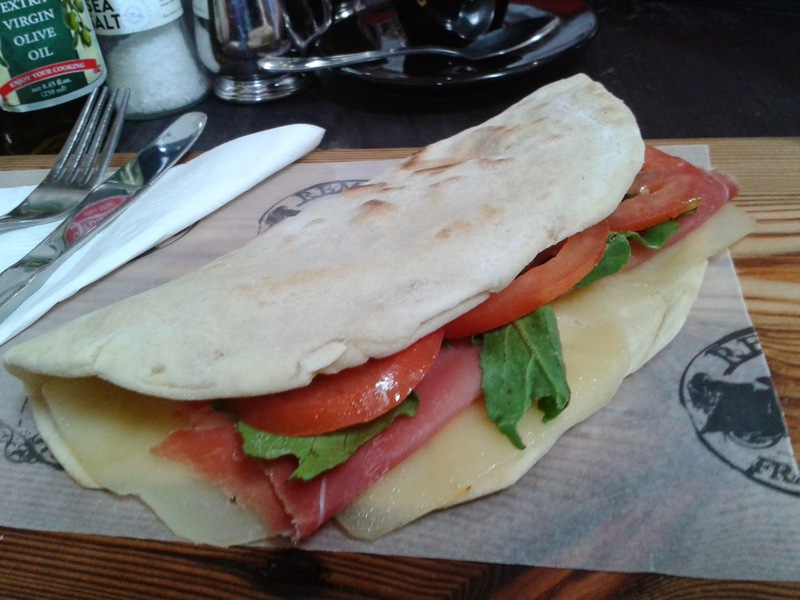 A piadina is an italian flat bread eaten on the streets of Italy and this one is filled with prosciutto and fontina cheese along with tomato and rocket. I was busy setting up a meeting for the Travel Massive PE chapter leaders to discuss the first Travel Massive networking event in the city and suggested that we meet at Fratelli. Ulterior motives you see. Owner Michelle Puggia greeted me like she greets all the patrons coming through the door. Friendly, welcoming and with a big smile. My companions got there a bit early and was tucking into their breakfasts already and on asking what I wanted I immediately referred Michelle to yesterday's FB post. They were still making the flat breads but she immediately agreed to prepare me one. When it came I was ready to tuck in but not sure what to expect. Would the ham and cheese me a little bland and not being one who eats rocket that often I wondered what the rocket would do to the taste. Boom! What a winner. The rocket and tomato is the perfect compliment to the meat and cheese and I made sure I ate as slow as possible to savour every second. Michelle came by to check how her first customer to try it was doing and asked why I wasn't eating it the way the Italians do, by hand. I just felt it would last longer cutting off smaller pieces. Nom nom nom. Just to mention, my friend Geoff had a croissant with scrambled egg and crispy bacon on it which looked absolutely divine and was my second choice of the piadina wasn't available. So next time you're looking for a nice intimate coffee shop with great food and lekker coffee for a quick mid morning meeting or brunch, this is the place to go. The Port Elizabeth Museum, which forms part of the Bayworld complex, has a very unique exhibit hanging in the Marine Hall. 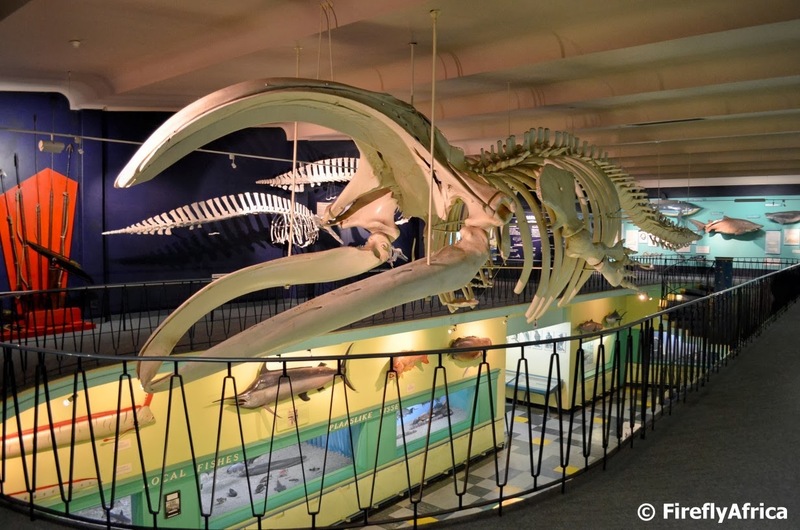 It's the skeleton of the last Southern Right Whale to be harpooned in Algoa Bay and is the focus piece of a exhibit that covers whales and sharks (amongst others) along with everything associated with them. These were the words in the Herald newspaper the day after the Great Gale of 1901. A storm during which 18 ships were wrecked and 38 people killed. 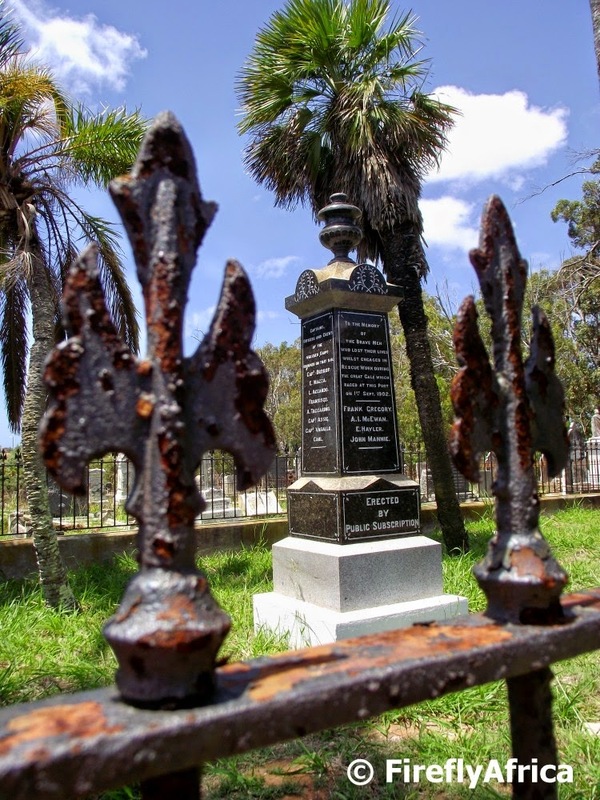 Although the event is fairly well known amongst those who know something of the history of Port Elizabeth, I'm sure very few actually know that there is a monument to those who died in the South End Cemetery. Looking at the monument, the names of those who died are divided into groups. 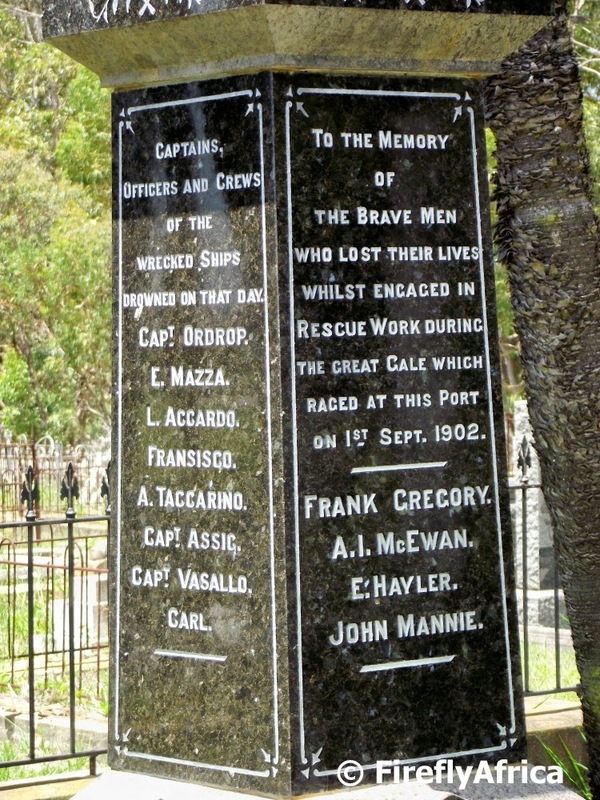 Here are the names of Captains, Officers and Crew as well as Rescuers who died during the operation. The peak summer holidays might be over but it doesn't mean that we have to stop going out to explore and experience out beautiful city. That we can do all year around. 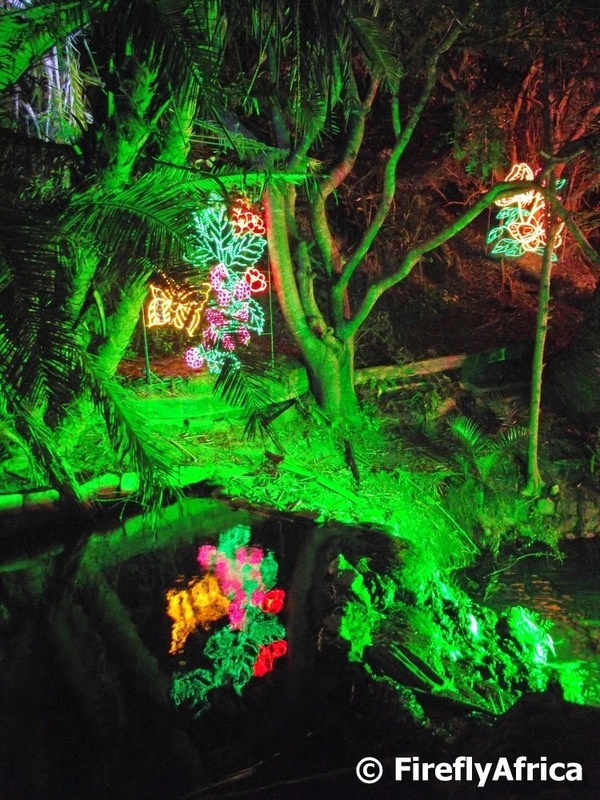 Something you can't do in winter though as the lights are only on in summer (unless they change that in future) is Happy Valley. So if you haven't been to Happy Valley this summer, why not get a few family, friends and kids together and head down there next weekend. Geocache containers come in all shapes and sizes. Usually the majority of urban caches range from nano to micro and small so its always fun to find a regular sized container. This one was found in one of the nature reserves just outside town and the KidZ loved finding it. Drama Princess actually has a container just like it that she still wants to put out there as soon as she finds a suitable place. The St Georges Brass Band has become an institution at the St Georges Park Cricket Ground over the years. Some people join in with them singing their lungs out while others despise the noise. Regardless of this it is hard to deny that the band has given St Georges a very unique atmosphere and once the local team gets their tails up and the band gets involved, its hard to stop the wave washing over the opposition. The African Oystercatcher or African Black Oystercatcher (Haematopus moquini), is only found along the coast of South Africa and Namibia. They mostly live on rocky shores and feed mainly on mussels and limpets. Those who live on sandy shores eat sand mussels and the Estuarine Oystercatchers typically eat cockles and pencil-bait. They mate for life and it is known of pairs that lived together for up to 20 years. They breed once a year and can get very loud if you venture too close to a nest or their young. 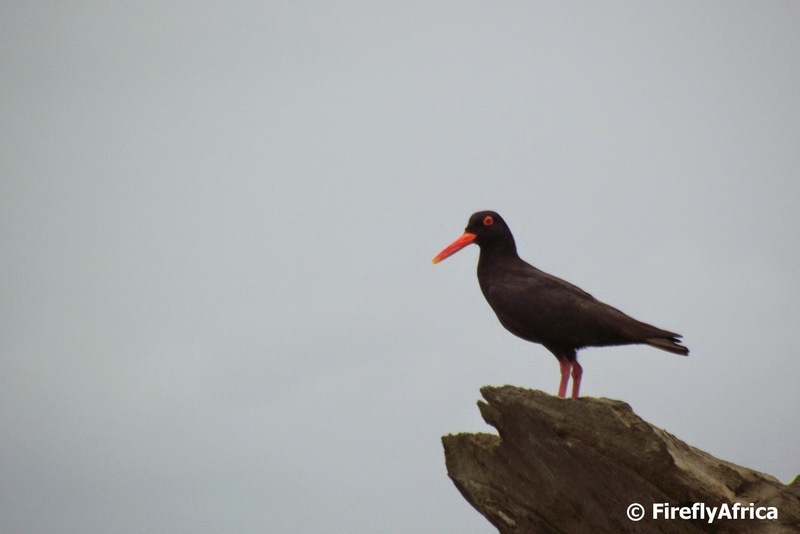 Back in 1998 the African Black Oystercatcher was considered a threatened species. 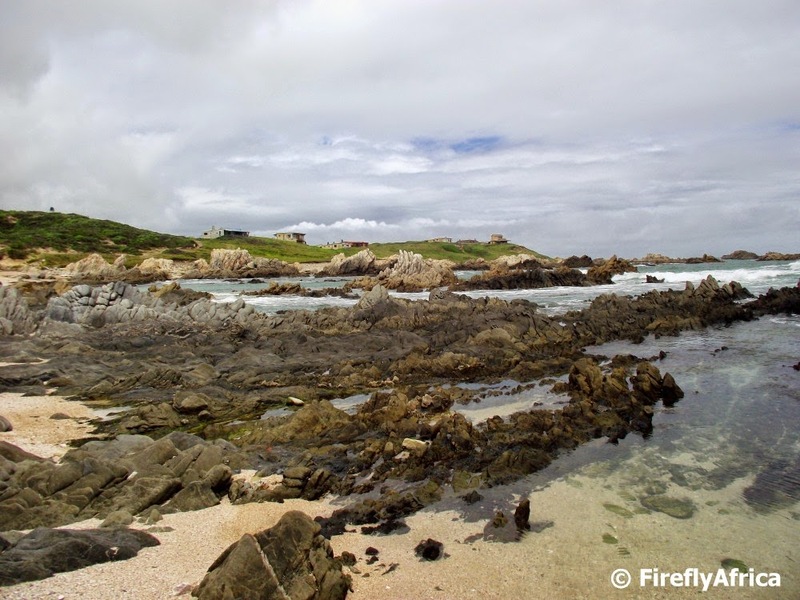 A conservation project was started and along with the ban of vehicles on the beaches and a increased food availability (mainly thanks to the rapid spread of the alien Mediterranean Mussel), their numbers are on the rise again. These days they are listed as Near Threatened and soon to be Least Concern which is great news. I was watching this guy on a walk along the coast at Lauries Bay recently and he seem to have been watching me back. 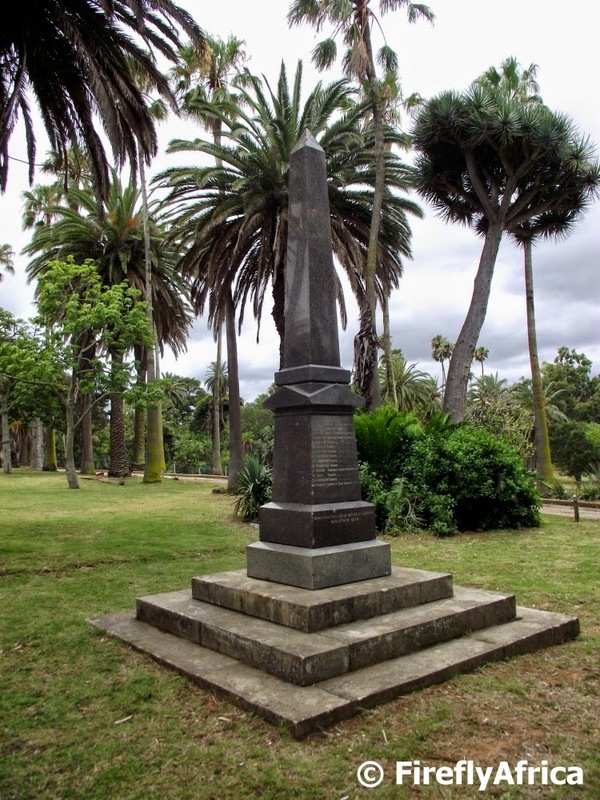 In Magennis Park just off Church Road (Graaff-Reinet Road) in Uitenhage is a monument that seems kinda out of place in this part of the province. It's a memorial commemorating those who died in the Morosi Mountain and Basuto Campaigns of 1879 and 1880-1882. Morosi's Mountain was the name given to a fortified mountain in the Drakensberg mountain range on the banks of the Orange River in southern Basutoland (modern day Lesotho). This was the site of a siege during the Gun War, also known as the Basuto War. It was given the name Morosi's Mountain after the Chief of a local tribe, who, after committing acts deemed as hostile to the Cape Colonial administration, fortified himself on the mountain. The Gun War itself was the 1880-1881 conflict in the British territory of Basutoland (present-day Lesotho) in Southern Africa, fought between Cape Colony forces and rebellious Basotho chiefs over tribal rights. Its always nice to encounter different critters and interesting things while out on a walk. Ok, not quite all critters. Nobody is keen on stumbling on a snake. A walk near Kini Bay a couple of weekend's ago delivered not a snake but a Angulate Tortoise. 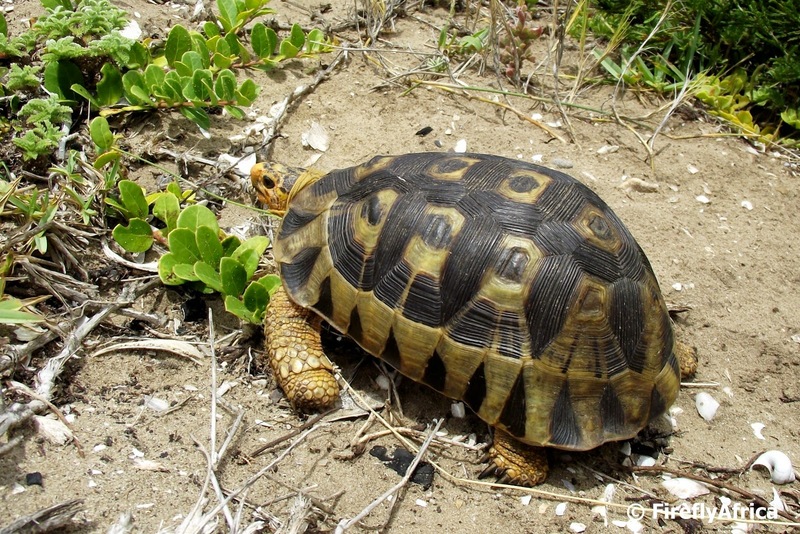 The Angulate Tortoise (Chersina angulata) is quite common in South Africa and found in dry areas and scrub forests. According to Wikipedia they are called a Rooipens Skilpad in Afrikaans, although I'm not sure that I've ever quite heard that name. I may be wrong though. There is considerable regional variation in this species of tortoise. 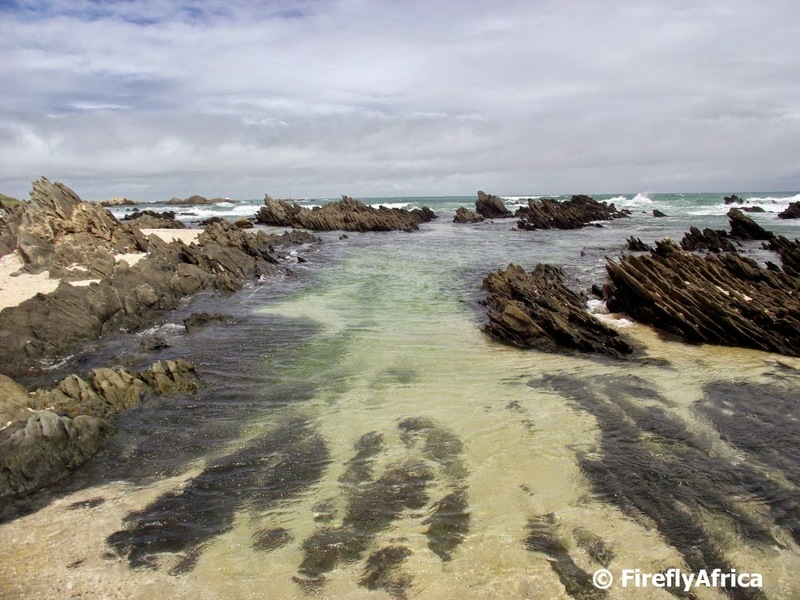 Individuals from the west coast of southern Africa tend to have a reddish colour, especially on the underside of their shell (ok so that is where the Afrikaans name comes from). 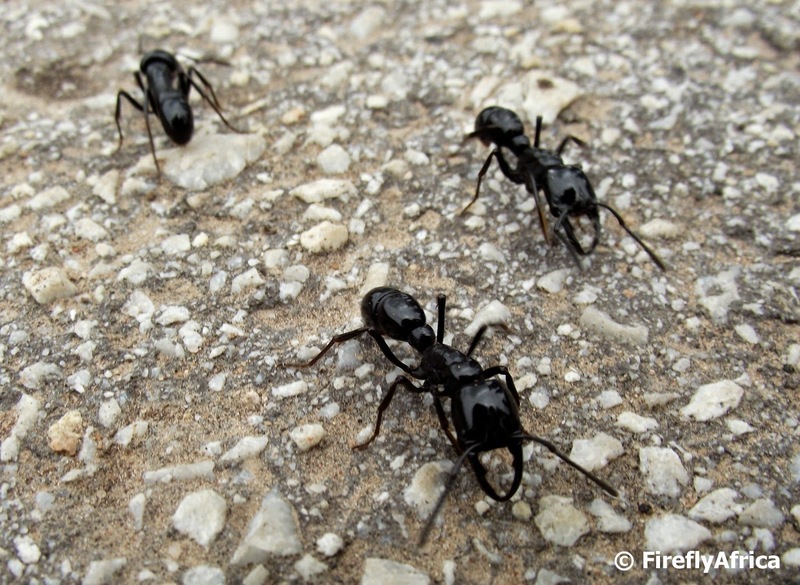 Inland specimens from the Karoo are often darker, and some are known to be uniformly black. To the east of their range, individuals are typically smaller and have a lighter colour. 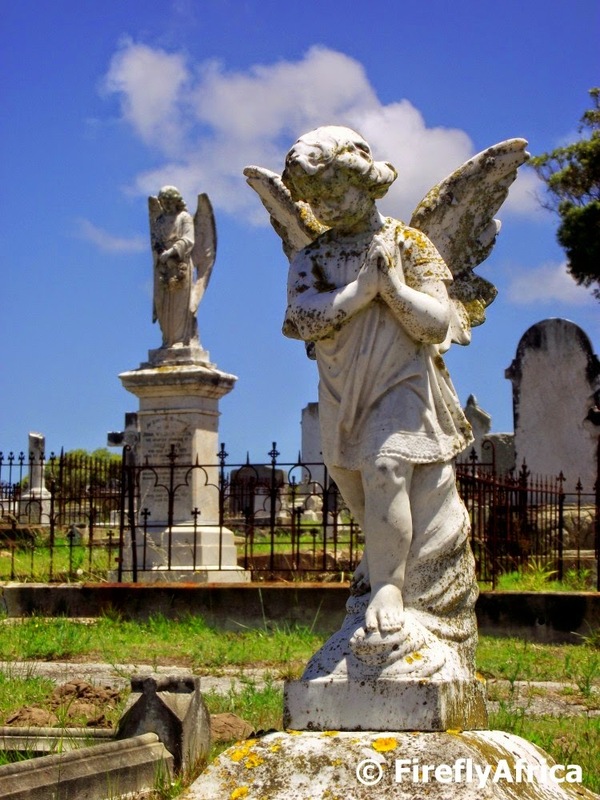 Port Elizabeth has some truly beautiful old historic stone churches around Central. One of them is the Holy Trinity Church next to Havelock Square. 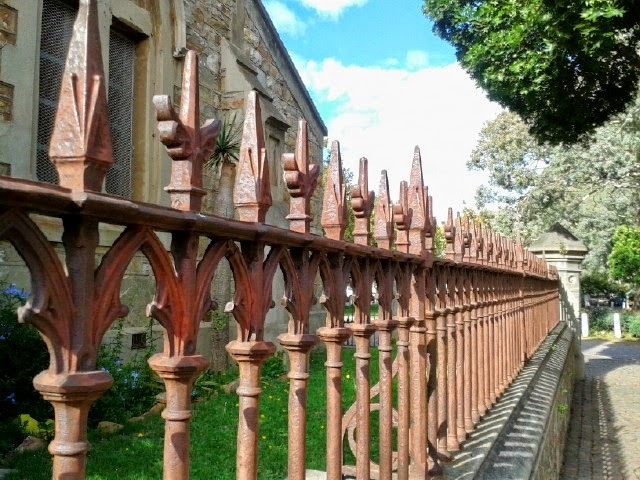 The Holy Trinity Church was established in 1854 when a group broke away from St Mary’s church and started having for services in a small room in Kemp Street. They later moving to a church at the bottom of Military Road with the first church on the present site opening for worship in 1866. The original church was gutted when a deranged woman set fire to it in 1897. The current Gothic building with it's magnificent stained glass windows was built from 1898. The church was consecrated in 1957 and declared a National Monument in 1993. 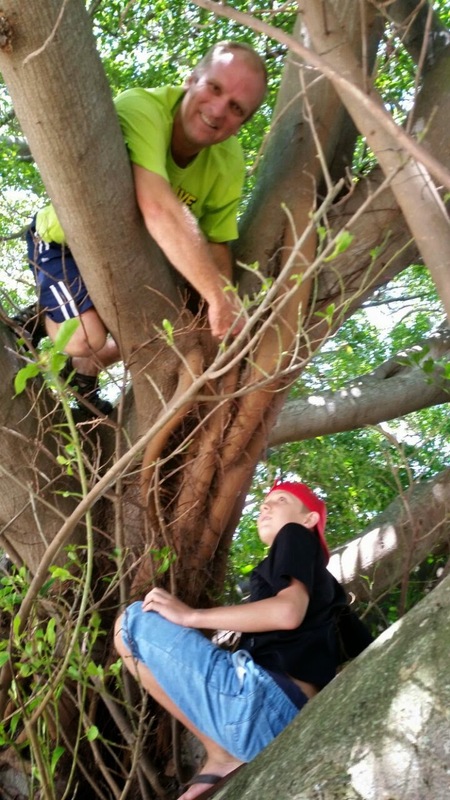 Geocachers seem to find themselves up trees quite often. Just looking back at the last year I've been a good 8 meters up a huge old Pine Tree, out on a limb of a Coral Tree in near gale force winds and crawling along branches in Wild Fig Trees. Heck, Wild Fig and Coral Trees are very popular cache locations and a little while ago I received a PAF (that's when one cacher Phones a Friend who has already found a specific cache they are looking for) to help out with a tricky GeorgeC12 hide in a Wild Fig. Sanhain struggled a bit to find a cache in a certain "Coolabah Tree" and luckily for him I was in the area with the KidZ. Even though I had found it only a week or so before it still took me a little bit to spot it again. The Shamwari Private Game Reserve is world famous and everybody knows about it, but have you ever been there? I used to go there quite often with guests when I was still a tourist guide and they still did day visits. Perhaps by posting this and asking very nicely somebody will pop me an invite... *wink* Anyhow, Shamwari is a stunning place and you can at least get a taste of it in this promotional video I picked up on YouTube. A little caching adventure in Uitenhage brought us to Cannon Hill overlooking the town. Walking back down the path Drama Princess gave a bit of a scream and jumped onto the grass. There on the path was a couple of seriously big ants making their way up the hill. I tried to get a close up but wasn't going to mess with this guys. Today was one of those days. You know, those where you just want to disappear off the radar for a while so nobody can find you. I feel tired and stressed and its all thanks to having my car stolen last week. Not just my car but also my backpack that was in the boot with my whole life in it. Except for the fact that we're going to have to make debt to buy a new car. The car was worth next to nothing, hence the insurance will pay out next to nothing, but it got me where I needed to go. Its also going to take me weeks to replace all the lost cards, my ID, driver's license and everything else that was in there. Did I mention that my camera was in my bag? #nuffsaid. 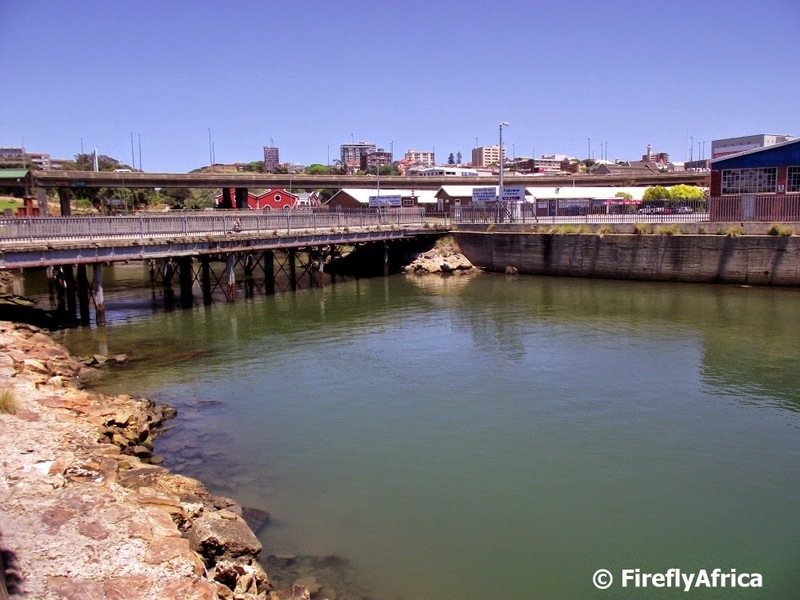 A week or two ago we went for lunch at This is Eat at the Port Elizabeth harbor and I was watching a couple of fishermen fishing where the Baakens River (Mouth) and the harbor meets. Going back to the pre-1960's this whole area around the harbor was where the residents of the old South End used to fish and feed their families from. The guys didn't have any luck while we were there but I hope they pulled something out after we had gone. 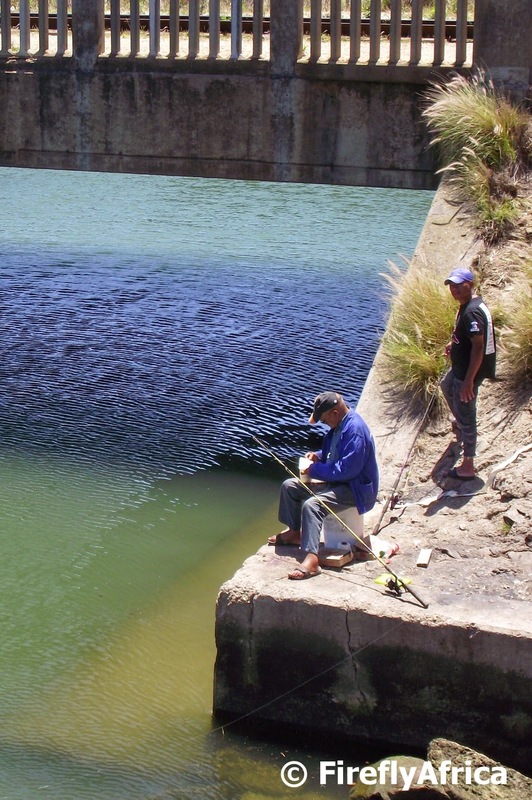 I think everybody (well I hope everybody) in Port Elizabeth knows the Baakens River. What most people probably doesn't know is that the Baakens River has its origins just to the west of the city and is only about 23 km long. 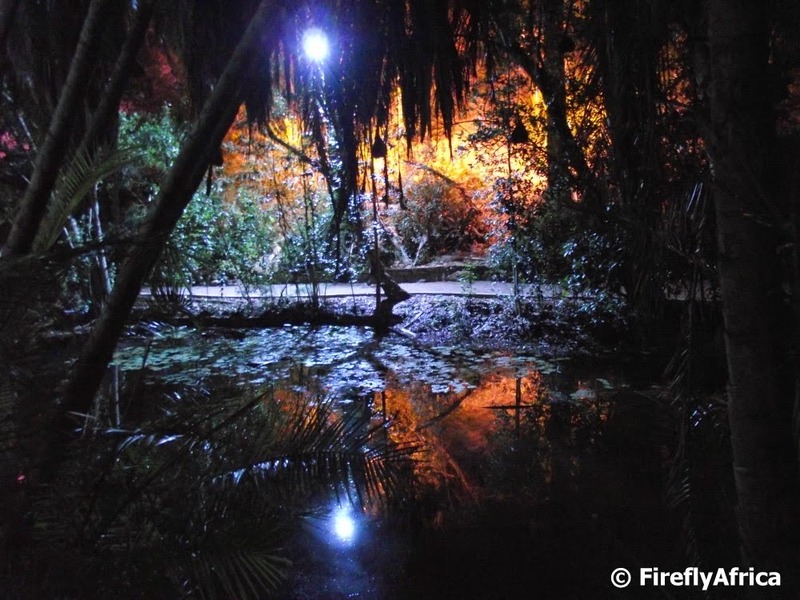 The Baakens River is surrounded by approximately 500 hectares of public open space which includes Settlers Park and the area between the 3rd Avenue Dip and Target Kloof. One of the things that make the Baakens Valley so unique that it is situation in a major urban environment and contains many examples of indigenous vegetation. The fresh water lagoon that used to be situated at the river mouth was where passing ships got their drinking water from with a beacon pointing out the spot where the water was fresh and not contaminated by the salt sea water anymore. This is also where the river got it's name from. Unfortunately as this was where ships anchored back then and where the first jetty was built, the area was later developed into a harbor which means that the Baakens River doesn't have a beautiful river mouth into the ocean, but rather consist of a channel that enters the harbor. It may not be beautiful but it still is very unique. Sport can be divided into team sport and individual sport. When it comes to Geocaching it can be a bit of everything depending on your mood or situation. 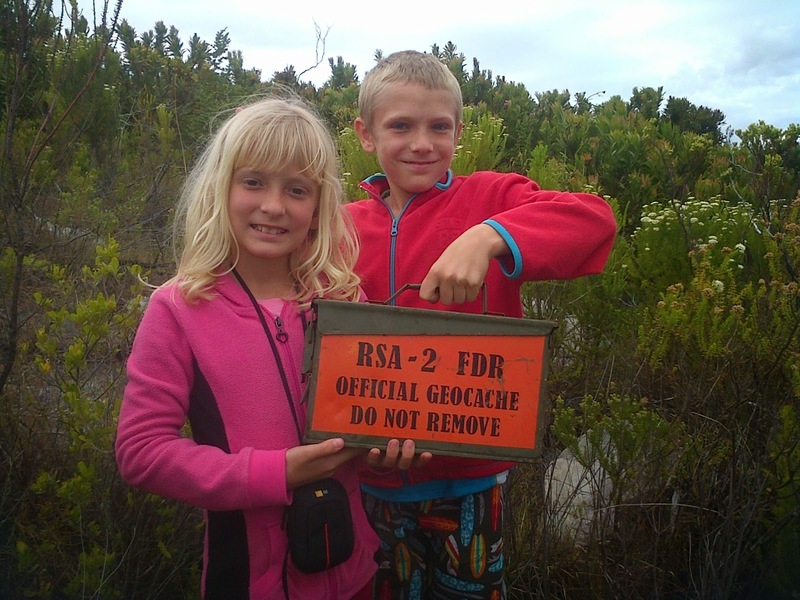 You can go caching on your own, with friends or with family. I actually enjoy every one of these and for different reasons. I find caching on my own is a great way to have "me" time while caching with friends can be lots of fun. As both Chaos Boy and especially Drama Princess enjoy Geocaching and even have their own profiles, I find its a fantastic way to spend family time together either as the whole family or with them individually. 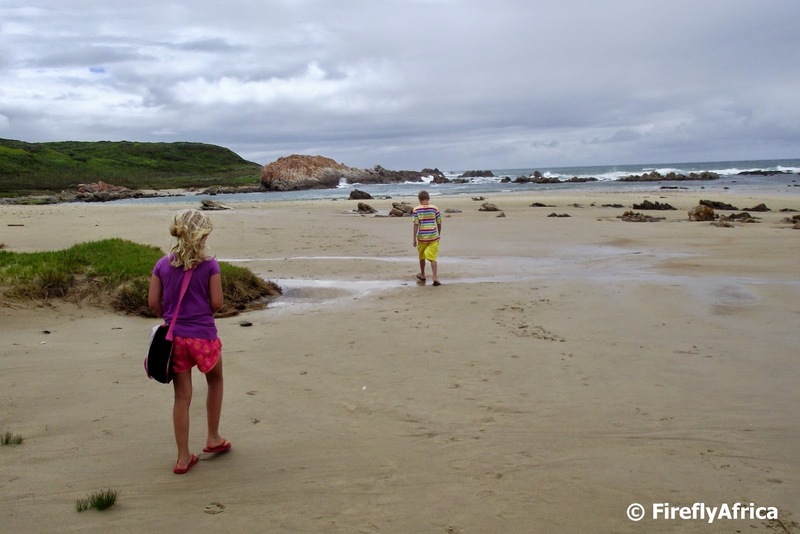 An opportunity to visit Lauries Bay near Kini Bay meant that we could go and search for a cache placed along the coast near there and for a change the whole family pitched in to find it again, even the Damselfly tagged along and helped with the search. Looking for a video to post today I came across this one of the Boardwalk Fountain Spectacular. It looks like an advert for Aquatique Show who could be the company who installed the fountains at the Boardwalk. The video is spectacular and really shows off how awesome this show really is. After yesterday's post on Happy Valley there was a comment by Grunt saying - "I understood that visitors get mugged when visiting Happy Valley. 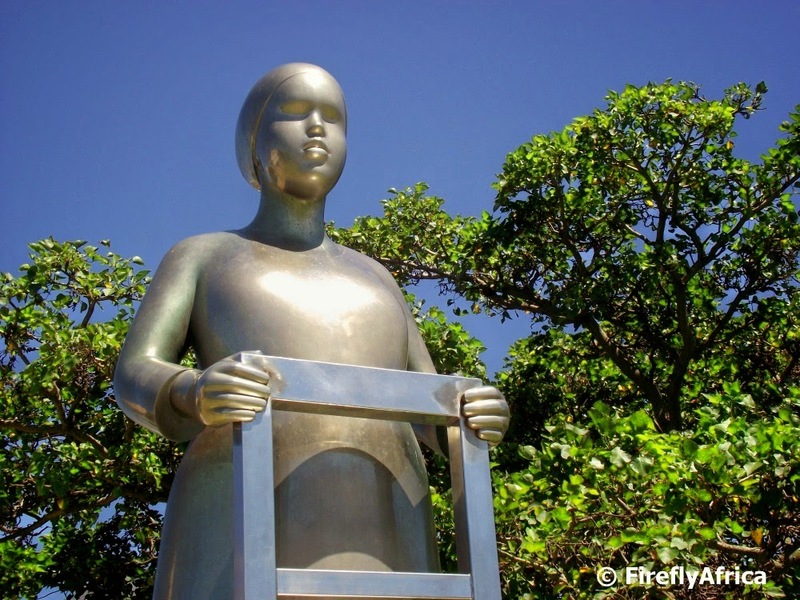 Used to love it as a child, but based on what I have heard, I tell visitors to avoid it." There probably hasn't been a mugging in Happy Valley for close to a decade. Yes, it was a problem area but it has been cleaned up and sorted out. The municipality even has two security guards stationed at Happy Valley to prevent it from happening again. Would it never happen again? Nobody can answer that question but people can get mugged on the street in front of their homes so anything is possible. I go for a walk up Happy Valley during the day quite often. Its quiet and the combination if running water and birds calling relaxes me. Will I go and walk up Happy Valley at night in winter when there is nobody around and the lights are off. Of cause not. That is asking for trouble even if you are in the safest places in the world. Will I walk up there to see the lights with the family on a warm summers weekend evening? Any time. I often think PE's biggest problem is it's own residents, specifically those who never get out and about and don't get to experience what this beautiful city has to offer. Excuse the blurry photo. I don't have a SLR camera and my midrange struggles in low light. 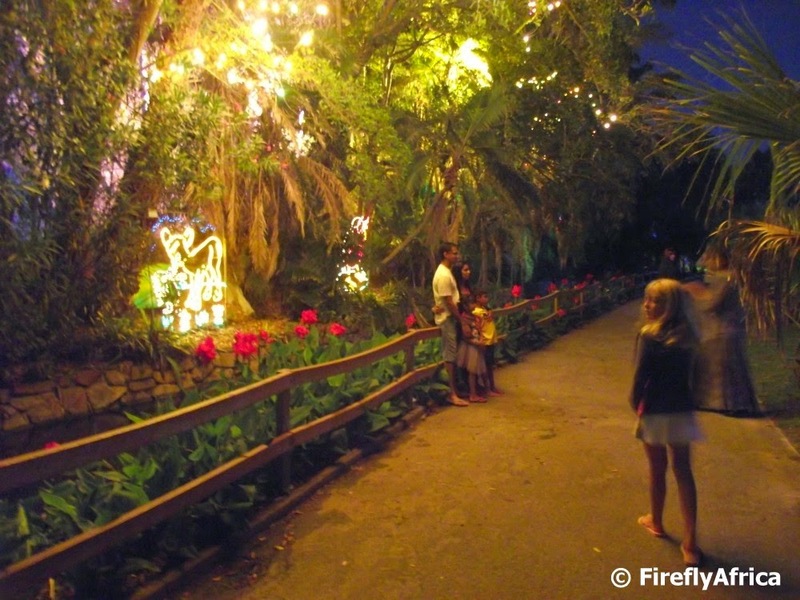 As some of you might know, I have a very special place in my heart for Happy Valley and it was the best news ever when the NMB Municipality fixed it up before this year's summer season started. I walk up Happy Valley quite often but with the Damselfly's operation we didn't really get a chance to go over the December holiday. A week or so ago we had a perfect Saturday evening and we bundled the KidZ in the car and headed down to Humewood. 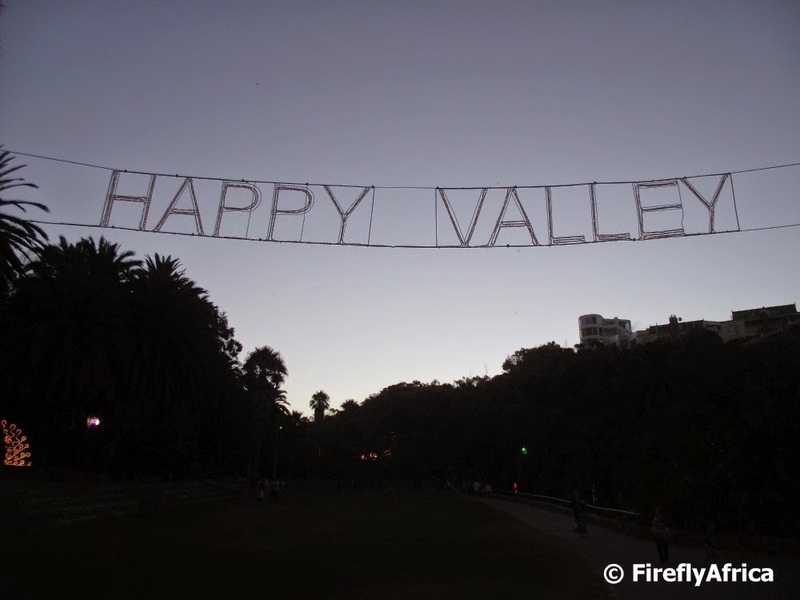 It was so great to be able to walk up the Valley at night again with the lights on. We also weren't the only ones who thought so with lots of other people around as well. Now I just hope the vandals don't mess it all up for the rest of us again. 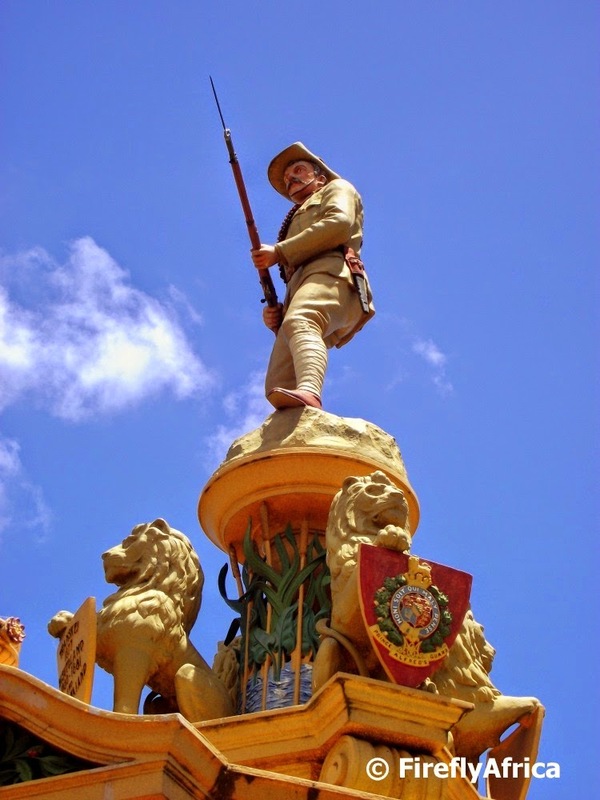 On top of the Prince Alfred's Guard Memorial in St Georges Park stands a guy with a gun. Who or what is he? Not to leave the question open ended and you all wondering what the answer is, here it is. He is a life-size figure of a sergeant-major of Prince Alfred's Guard, in full dress and standing at the "charge". Lauries Bay is situated on the Wild Side close to Kini Bay and is a collection of shacks (as the owners call them) on private land. To get to it you either need to know somebody there to get access via a dirt track or walk about 2km along the beach from Kini Bay. On the eastern side of Lauries Bay is the locals' most popular fishing spot called the Red Rocks. I headed that way not to fish but to find a Geocache located there and snapped this pic (edited with a bit of HDR) looking west. 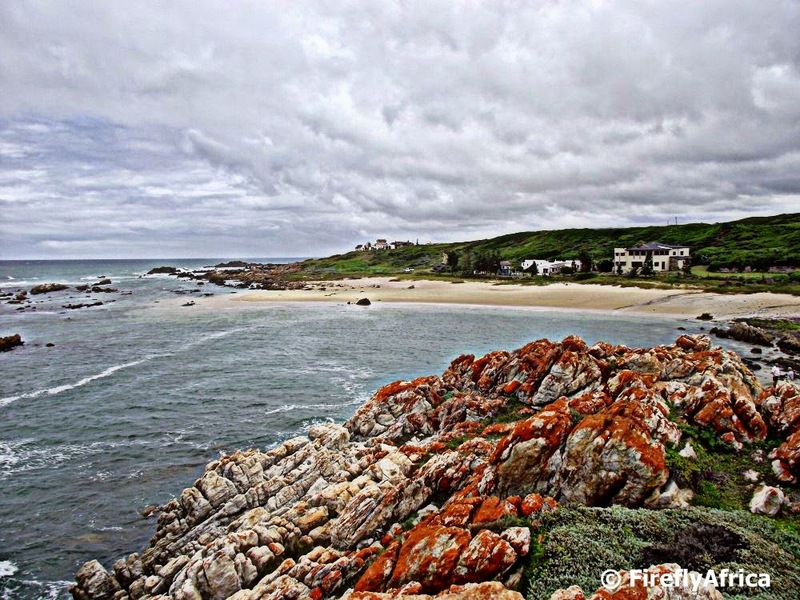 Port Elizabeth's Wildside has a notably rugged coastline. It's not called the Wildside for nothing. It does mean that there are countless gullies and spots between the rocks to explore and enjoy. Like this one at Lauries Bay near Kini Bay.